Quickly responds to the pitch and envelope of the input sound to create a thick synth sound with no hint of latency. Two synth sounds can be output at the same time, and these sounds can be mixed together to create a variety of tones. The original sound can be mixed with the synth as well to create an effect that sounds as if the original sound is playing in unison with the synth. What's more, an extremely deep sound can be produced by mixing in a pitch one octave down. 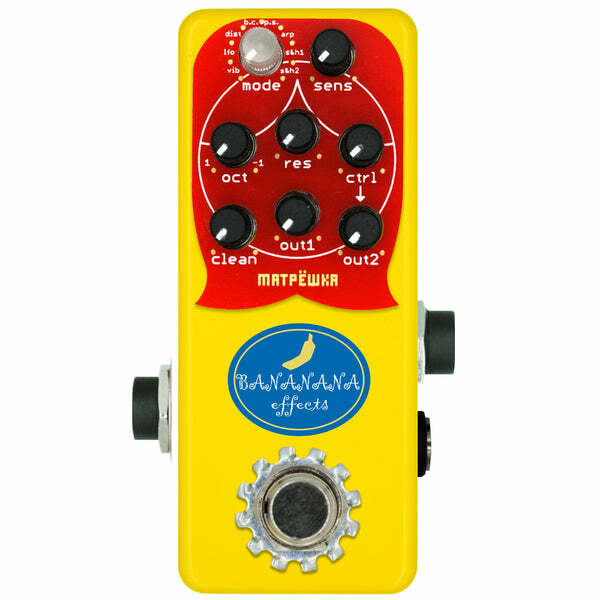 Modulate the pitch up and down to create a growling tone. A chorus effect can also be obtained by mixing with the output from out1. Create a growling tone by periodically shifting the filter sound. The depth of the LFO can be adjusted by the input signal to create a dynamic synth sound. Distort the synth output to create a tone like an acid bass. The output can be powerfully distorted while retaining low frequencies by pairing with out1. *In this mode, the low frequencies of out1 are emphasized for easy pairing with distortion. Lower the bitrate of the synth output to create a digital-style distortion. This can be changed to a synth sound like a human voice by adjusting Sensitivity. Modify the pitch of out2 to -4th, detune, 5th, or one octave up. An extremely heavy bass sound can be produced by mixing out1 and out2. Alternate between the same octave as the input and one octave down. Speed up the cycle to create a tone like that from a retro game. *In this mode, the high frequencies of out1 are emphasized for easy pairing with out2. Periodically shift the frequency of the filter at random. Setting resonance to max will cause the filter to oscillate and make it possible to output random pitches. Periodically modify the sampling frequency of the synth output at random to create a glittering digital-style distortion. This can be changed to a synth sound like a human voice by adjusting Sensitivity. Adjusts the input sensitivity of the envelope filter. Filter feedback control. It will oscillate when turned fully cw. Level control for the dry signal. Level control for the synth signal without the effects. Level control for the synth signal with the effects selected via the mode knob. How is it possible the sound that came out in that little box is huge? Even more amazing with a reverb. First empressions were, 'ah cheap knobs'. Once you plug it in and mess about that feeling's gone. Color change is great since it is a small pedal. 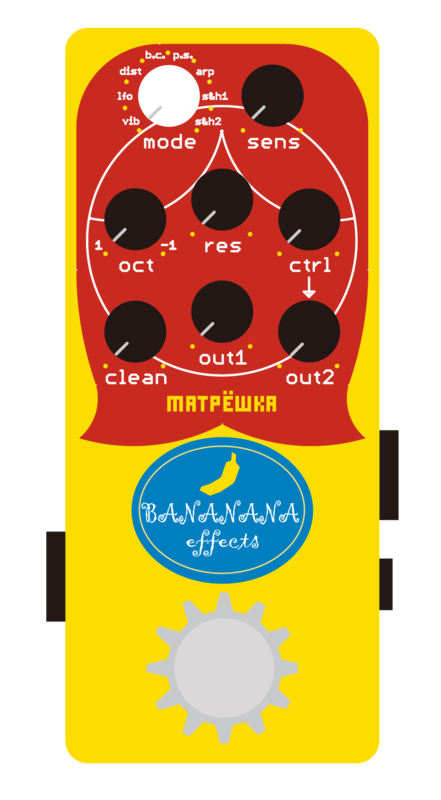 I use it as a guitar mod and it's polyphonic synth. Very inspiring pedal! Favorite Modes: Distortion, Vibrato, Pitch Shift Least Favorite: Aliaser S & H, Filter S & H Pros: -Many Effects -Visualy Pretty -Unique very active Synth Sound -Super Light - Huge difference in Sound on how you Approach your Strings Cons: -Fingers Won't fit between the Knobs -Because its so small, the Knobs can be Moved easily accidentally -You Can Put Effects over the Regular Synth Sound but You can't Shape the actual Synth Sound except with the res and the sensitivity Knobs. 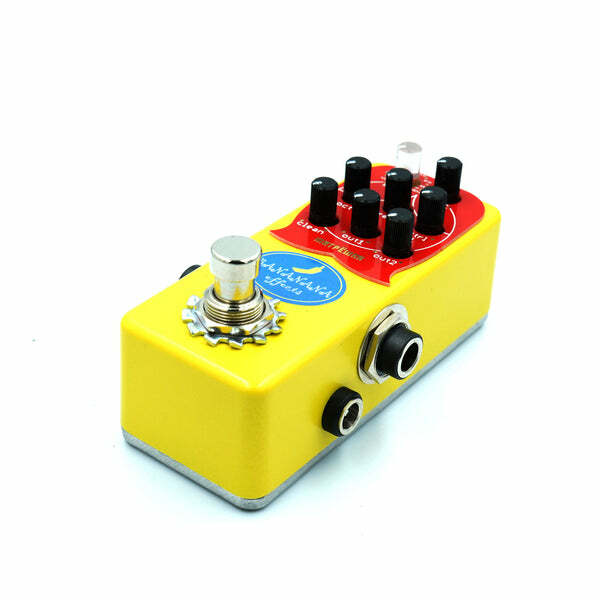 Don't let those many Effetcs in 1 Little Pedal Blind You, only buy this if you like the Regular Synth Sound of this Thing. I would definetely say this Pedal isnt for everyone, if You want a really aggressive all Out weird Synth Sound this could be interesting for You. If You want a Smooth Sounding Synth Pedal there are Better Options on the market. Also one little tip, this combined with a Reverb is extremely Beautiful.